The best time to visit Aruba is winter through spring for people who want to escape cold northern climates. 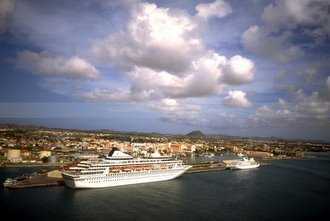 The Aruba cruise port of Orangestad is an easy port to tour in a short period of time. This brief video lists 10 of the best attractions in Aruba. The Aruba hurricane season is one of the mildest in the region because the island lies on the southern edge of the hurricane belt. Aruba beaches are among the best in the Caribbean because of their size, sand and atmosphere. The Natural Pool is an unusual formation of rock and volcanic stone along a deserted coastline in southeast Aruba. An Aruba family vacation is likely to make people come back for more. The island has many repeat visitors. See the historical temperatures and rainfall for Aruba by month so you can plan your vacation around good weather.